I just installed the corbeau moab seats. Yes, they bolt right into the stock seat mounts. No problem at all on my 82 WT cherokee. Bolted right in. Great fit. I have the non-electric mounts but I suspect they would work fine on the electric mounts too. Nice seats. I am very happy with them. Looks great. What material did you decide on? how are they now they have been in for awhile! do they fold forward to gain access to the rear? very cool. they look really good in there. I have only had them in for a few days. I like them. Here is a picture folded forward. You can get to the back area. Climbing back is a little more difficult. I think it was easier with the short seats. I am 76 inches tall and my head will rest against the back. This was a really good upgrade from a safety and comfort perspective. One rear end collision and the pain I avoid from those POS original seats will pay for itself. But I got the local 4wheelparts store to lower their price enough that the tax I had to pay made it a little less expensive than these places which offered free shipping. Now picture these seat belts, and YES, there is a disconect so folks climbing into the rear can get in! 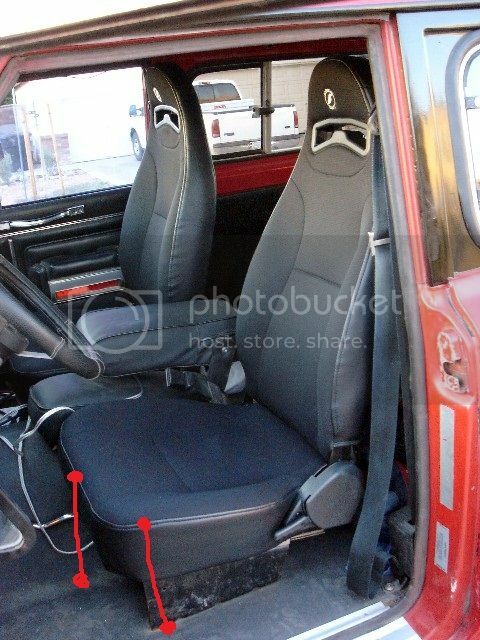 Very cool, Inertia Reel Harness seat belts FOR THESE SEATS! Those are really nice seats. Way to go! EDIT.. sorry for digging up the old thread. Just saw the original date. No problem.. Since then I have added the safety harnesses and a tuffy console. Can I get a couple measurements? I don't have a tilt steering column, and I'm a big guy. The first spot is the high corner of the seat where you get in at to the floor and the second is from the front to the floor pan. I want to compare them to my stockers to see if they are higher or (hopefully) lower. Last edited by Atla : 09-05-2012 at 05:47 PM. How did you mount your tuffy console? Did you just drill holes and run the bolts straight through the floor using the tuffy box as a template or did you elevate the box off the floor with some kind of spacers?